1305660625 -Through ongoing research into students’ workflows and preferences, SOC from 4LTR Press combines an easy-reference, paperback textbook with Chapter Review Cards, and an innovative online experience – all at an affordable price. New for this edition, students explore SOC anywhere, anytime, and on most devices with SOC Online! With the intuitive StudyBits™ functionality, students study more effectively and can visually monitor their own progress. Coupled with straightforward course management, assessment, and analytics for instructors, SOC with SOC Online engages students of all generations and learning styles, and integrates seamlessly into your intro to sociology course. 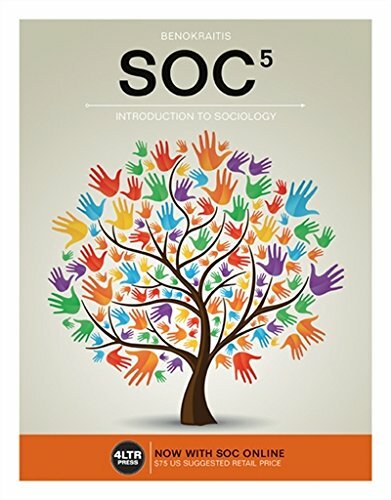 SOC features clear and provocative examples that help students grasp abstract ideas, understand conceptual relationships, and spark their sociological imaginations. Each addition includes updates to all figures, tables, and related texts.